Incorporated in r8749 (although in the end a totally different patch from scratch, to better obey rotations etc.) I my testing I go occasional 2x3 as largest size but 3x3 almost never appears. 2x1/1x2 are very frequent, and 2x2 less than 10%. 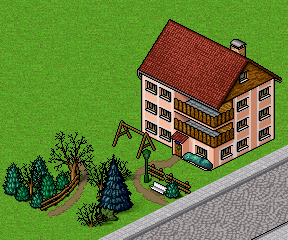 Import for this patch is that larger houses will not be broken into smaller ones. Hence one should have at least every 6 levels (e.g. level 6, 11, 15, 20, 25) for a house of that type in that size or the city will grow quite large, since a lot of places are blocked for further renovation. Furthermore, the rotation are determined at build time, but the city grow on and often the rotation does not match at later stage. So I think 8 rotations for 2x2 buildings do not make sense. If so, one could circumvent this issue simply by not spawning larger buildings initially, but only at slightly higher levels, at which point all roads are already buildt. The only thing speaking against this would be that on renovation, no empty tiles can be included. However, there is a different problem: 8 rotations wouldn't work for non-square buildings. For each of the four main rotations, the corner can either be to the right or to the left, that would already be 12 rotations. If you had only the left or only the right corners, as 8 rotations imply, people like me will complain anyway so perhaps 4 rotations are better than 8. I'd like to point out, though, that there is a rather different option: Seperate tile-rotation and building rotation. This would allow for seamless combination of multitile-buildings and 8-rotational rowhouses, as all tiles of the multitile-building would obey the very same rotation rules. 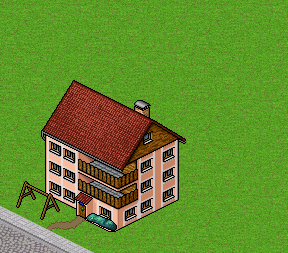 You could have a 2x2 building with no rotation of it's own, but it's tiles use it's own rotations to "connect" to the sidewalk of the road or place fences on all sides without roads, since there would be neighbouring buildings. You can have a door on each tile that faces a road, but not on tiles that don't face roads - something like that. 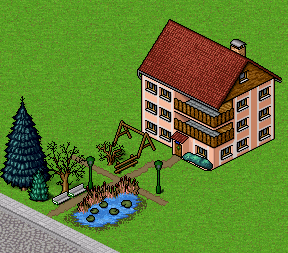 All the things where it's not a matter of actual building rotation (which is front yard with the nice facade, which is the back yard with the smoker's corner...) but a matter of which tile specifically connects to a road. 8 rotations work out for 2x1/2x1 buildings, which are the only one that will appear frequently. 2x2 I would only use at very high levels, like occasional big parks, large skyscraper etc. And even with renovation realign the rotation, it tend to not match due to later roads on the backside etc. I have added a debug routine. If you use a debug build, then the routine tells you the current rotation, and the "best" rotation on the current road loayout. 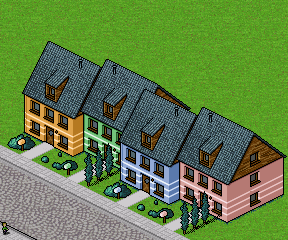 Those mismatch in later stages in about 60% for 2x2 buildings ... For smaller building this is less of an issue, since their "roadfront" is shorter. 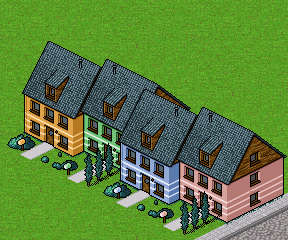 And no, I will not rewrite the building routines from scratch to include individual tile rotations. It was hard enough to get the layout looking right to a human.